When I hear the word “pioneer”, I think of someone venturing forth into uncharted territory….like Daniel Boone cutting a path through the thick forests of a wilderness…or Christopher Columbus finally sighting land (America) after weeks and weeks at sea. If you can remember anything from your high school World History classes, you might recognize the names of some other famous explorers, such as Juan Ponce de Leon, Vasco de Gama, Ferdinand Magellan, Hernando Cortes, Lewis and Clark, or Henry Hudson. But for those of us living during the 1960s, the Mercury 7 NASA astronauts were the 20th century’s foremost pioneers. President John F. Kennedy was passionate about the United States entering what he called the “space race”—an attempt to be the first nation to put a man on the moon. Star Trek fans may recall hearing the voiceover at the beginning of the TV show referring to space as “The Final Frontier.” And so it was….uncharted territory just waiting for exploration. Although I was in elementary school, I vividly remember when Astronaut John Glenn was shot into space and circled the Earth 3 times—the first American to orbit. The date was February 20, 1962, a Tuesday, but school was dismissed for the day so everyone could watch via TV. Glenn’s trip took approximately 5 hours even though he flew at speeds of 17,500 miles per hour. Earlier in 1957, Glenn had set a new supersonic jet speed record for traveling from coast to coast (Los Angeles to New York) in just 3 hours and 23 minutes. In 1974 he was elected to the U.S. Senate and served 4 terms. Still exhibiting a pioneer spirit, Glenn returned to space in 1998 at the age of 77, the oldest person ever to fly in space. He flew aboard the space shuttle Discovery on a 9-day mission and helped conduct research on aging and space travel. In 2012 at the age of 90, John Glenn was awarded the Presidential Medal of Freedom. Yes, John Glenn was (and still is) truly a pioneer in every sense of the word. But likewise, you and I are also pioneers. We awaken each day with uncharted territory and time lying before us and venture forth not knowing what the day may hold for us. We must simply trust in a God who can —and will— lead and guide us through all the circumstances that come our way. You and I may not know what the future holds, but as Christians, we know WHO holds the future. Tomorrow morning when I awaken, I plan to offer my day to God….and acknowledge that He and I will explore it together. As John Glenn viewed the Earth from a Discovery window on his 1998 mission, he commented, “To look out at this kind of creation and not believe in God is to me impossible.” (actsweb.org) May you have a blessed August as you and God “pioneer” through each day of the month. Photo courtesy NASA Johnson Space Center. 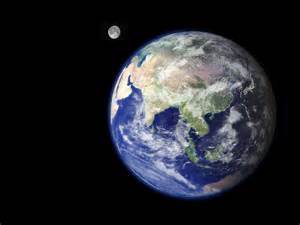 This famous “Blue Marble” shot represents the first photograph in which Earth is in full view. The picture was taken December 7, 1972 by the crew of Apollo 17.